Community Service - The giving of one’s time, efforts, and skills outside of school class time for the purpose of benefiting the community (local or global), without monetary compensation. In order to promote civic awareness and volunteerism, LBHS requires students participate in FORTY HOURS of approved community service as a graduation requirement. Ten hours per year are recommended. Seniors are encouraged to complete their hours by the end of their first semester, to ensure all their hours are complete and accounted for by graduation. 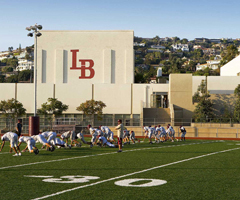 Students who are not enrolled at LBHS for all four years will have their hours adjusted. Community Service participation may include community/school volunteerism, city, youth and environmental projects, student assistance, and tutoring. Acceptable community service must be done for a non-profit organization. (Any other service must be authorized by LBHS Administration). Community Service Cards are available in the Activities Office. Are you interested in or have a passion for a specific issue/cause/organization? Do you want to volunteer for different events/organizations, or are you looking to make an ongoing commitment? When/how often are you available to volunteer? Can they depend on you to follow through with your commitment? Is there a friend that you would like to join you?